It has been a bad year for the Neapolitan Song. In March, Roberto Murolo passed away, and the day before yesterday it was the turn of Sergio Bruni. He was 82. Services will be held today in the "artists' church," the Church of San Ferdinando, across from the Royal Palace. Bruni was praised in il Mattino, the Neapolitan daily, by Roberto De Simone, musicologist and the authority on anything musical having do with Naples, from opera to folk and pop music to—in this case—the Neapolitan Song. De Simone recalls that playwright Eduardo de Filippo once called Bruni "the voice of Naples," a title that stuck, as did De Simone's own reference to Bruni as an "aristocrat from the people." Bruni, in fact, was born poor in Villaricca, a town near Naples, and started his life in music by learning to play the clarinet for the town band. Sergio Bruni was a stage name; his real name was Guglielmo Chianese. 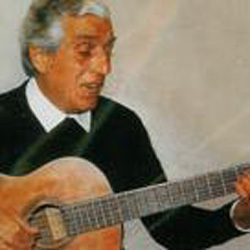 Though perhaps not the academic anthologist of music that Murolo was, his active career as a singer spanned more than three decades, starting in the 1950s, and—with Murolo—Bruni enjoyed the reputation of one of those performers who helped the Neapolitan Song survive the onslaught of American popular music at mid-century. He was a dedicated opponent of the napolesi, as he called them (using a non-word instead of the standard adjective, napoletani to describe the false quality that he detested), those purveyors of commercial Neapolitan-ness, the hawkers of 'o sole mio. When, some years ago, the Italian state television network, RAI, pulled the plug on its Festival of Neapolitan Song, Bruni said that he and his friends popped open four bottles of champagne to celebrate. And when he read a music maven's complaint in 1975 that the "true" Neapolitan song was dead, he teamed up with noted Neapolitan poet Salvatore Palomba to write the haunting Carmela, now a classic and one of the best-loved of all Neapolitan songs. In the 1970s he again worked with Palomba in a television production entitled "Unmask Pulcinella," noted, as the title might imply, for its lack of sentimentality about Naples, the "land of sun", yes, but also the land that hundreds of thousands of emigrants had deserted earlier in the century in order to find a better life. In such work, it is fair to regard Bruni as a forerunner of more recent singer/songwriters such as Pino Daniele and others, whose music is often a litany of what has gone wrong with Naples. Bruni was both a Communist and a devout Roman Catholic, one, they say, who would read the Bible before dinner and Che Guevarra at bedtime. He was an active participant in the popular uprising against German troops in the city in 1944, an episode known as "The Four Days of Naples". His other activities included, for example, a brief appearance as a hotel musician in Billy Wilder's delightful 1972 film, Avanti .